Noticed anything different happening on Google recently? Well, if you have a Google+ Local account or a Google Places listing for your business, you should now have been upgraded to the new 'Google My Business' account which merges search, maps and Google+ bringing all your business information into one place. This means your customers will see more information about your business in the search results such as opening hours, ratings and reviews. 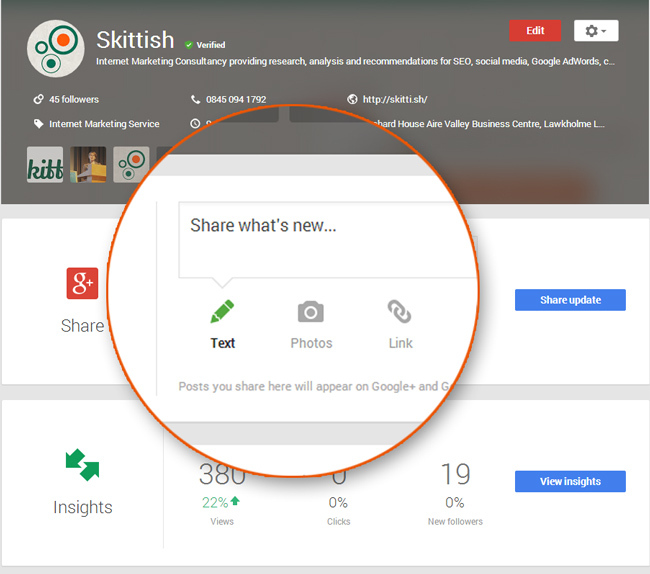 This also means you can post updates to your profile as you do already with your Google+ Page, and also receive reviews and '+1's from your customers. You'll be able to respond to customer feedback and really start to engage with your audience. All this information is now available on any device so whether your customers are sat at home on their desktop researching insurance companies or out and about looking for a good Italian restaurant within walking distance, they'll be able to view your business details, opening hours, phone number, directions as well as read other customer reviews. You can even use Google My Business to host Google Hangouts with your fans - connecting with them face-to-face! Google have also made editing your profile much easier by bringing all your account information into one place and providing us with a Google My Business App which you can download to your smart phone and make changes on the move or be alerted to new reviews from your customers. The app is now available to download from the Google Play Store (Android) and Apple App Store. If you haven't already, it's worth accessing your Google account to review the details they have for your business and making sure they are up to date and your profile is 100% complete. This should improve the likelihood of your profile being viewed and clicked. Older PostIs your website costing you sales?